The protracted pay campaign in the universities which began last summer and escalated into an industrial dispute three months ago with a national one-day strike followed by a boycott of exam marking, finished its first phase on 6 June. 1 June, London: university teachers march to rally outside the employers' offices. Union negotiators accepted an offer which, slightly improving on those made on 8 and 30 May, will give cash increases amounting to 3.5% during the first year, 4.5% in the second and at least 2.5% in the third, with a joint review of finances. Now members will vote on the offer. The total "uplift" on salaries after the first two years amounts to 10.33%. The major difference and improvement in this latest offer is the "opening of the books" in the third year, leading to a joint review of university finances. This was a dispute marked by several victories for the unions and some lessons learned for the newly formed UCU – the University and College Union. One victory of the dispute is the increase in recruitment to the union, measured in thousands, over the past few months. 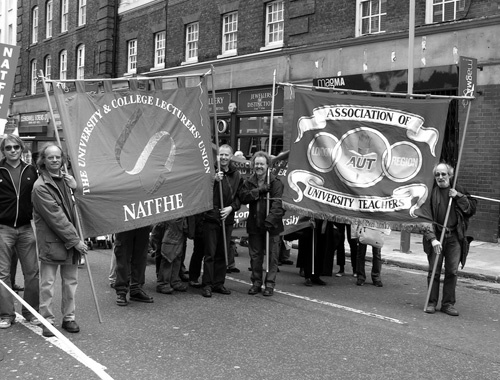 The two unions Natfhe, representing academics in the newer post-1992 universities, and AUT mainly representing staff in the older pre-1992 universities, merged on 1 June to form UCU. This merger has been a long time in the making and will need patience over the next year to bring together some differences in style and culture of trade unionism in further and higher education. It becomes the biggest trade union in post-16 education anywhere in the world, representing lecturers, researchers and academic related staff in universities and further education colleges throughout Britain. Small differences in tactics by Natfhe and the AUT in this single struggle to win fair pay may have made some contribution to the need to call off the action when it seemed to many that it was just becoming truly effective. A lesson learned, perhaps. But next time, when the joint, open review of HE finances agreed to by the employers takes place in 2008, the union should be fully integrated and ready. For now, there was no alternative but to call off the action in the face of the most intransigent, ruthless set of managers higher education has ever seen. The potential impact on students of the refusal to mark and the degree to which the employers exploited this, cheered on occasionally by the government and the media, should not be underestimated. To carry forward this sort of sanction, which inevitably means acting individually, often on different timescales to those in other institutions or even colleagues teaching on different courses, is as tough as it gets. Many were faced with punitive ongoing pay deductions. Compared with this, a one-day strike picketing in the freezing rain could be seen as "a walk in the park". The leaders of the National Union of Students and, in particular, its president, Kat Fletcher, backed the industrial action despite severe pressure from some student groups in parts of the country. Unions at Leeds Metropolitan University, UCU and UNISON, are gearing up for more local action this summer. About 25 academic redundancies have been declared in two separate parts of the university, which is faced with so called financial shortages. One of these areas, the School of Languages, is set to shed half of its English Language staff. One woman in the redundancy pool is Sue Birch, who recently won a landmark case against Leeds Met for failing to take her on as full time even though she had spent 7 years as an hourly paid part-timer doing more teaching and course organisation, and working longer hours, than a full time post requires. Just before the final ruling in January of this year, Leeds Met settled out of court and offered her a full-time job and £25,000 compensation. Now, it appears, they want to take revenge and ruin the lives of many of her colleagues as well. The campaign to fight these vindictive moves and block what would be the first ever compulsory redundancies at Leeds Met is under way. The unions are also battling against a ban on leave, set without negotiation by the vice chancellor, during his "Staff Development Festival" fortnight, which begins in August Bank Holiday week. His strange daily reflections on the university website have the occasional threatening innuendo among the constant heralding of yet another partnership or triumph of sporting or artistic achievement. References are made to those who disapprove of his ideas being "helped to find other settings". An odd letter to staff during the pay dispute talked of unprofessionalism and of people being dismissed for vaguely referred-to misdemeanours. There are now proposals to introduce a new calendar, with limited consultation, which would reduce even further the staff's ability to take annual leave by reducing Christmas and Easter vacation time – and most worryingly by bringing in summer teaching and two-year degrees. Management like this is becoming more common throughout higher and further education – where the ability to question or argue against ideas in the organisation would seem to be fundamental to a notion of academic freedom. At Leeds Met people are now wary of any form of protest. The VC's "A to Z of Shared Expectations" sees to that. E is for email etiquette – which basically means do not share your ideas or thoughts on the email because if they are at all critical of his plans then you could be disciplined or worse. An air of intimidation now prevails as people try to express concern about the riotous spending of this VC. Fancy new buildings, smart residences for the VC, promotional image-making through an endless stream of sponsorships for rugby league and union, cricket, football, all use the Carnegie name of the old college that forms part of the new university, and all come at the expense of retaining and rewarding its employees. Not content with £3 million for a stand incorporating teaching facilities in the Headingley rugby stadium and £100,000 spent at the adjoining Headingley cricket ground (now called the Headingley Carnegie Stadium) to surround it with Leeds Met logos and slogans, a new pavilion is to be built in the cricket ground and festooned with the Leeds Met name in time for the next visit here by Australia for the Ashes series in 2009. None of this spending ever involves consultation with the staff affected. Indeed, to challenge it brings more threats on his daily 200-word reflection. Sometimes, though, threats bring opportunities. Leeds Met is an "Investor in People" and this summer it is being reassessed for the award. An independent assessor will be interviewing a selection of staff who will be asked to give, anonymously, their views on the management's leadership and development style. The opportunity will not be missed. The Universities and Colleges Employers Association adopted bullying and underhand tactics from the start – and were even hauled in front of the Commons Select Committee for Education and Skills to be admonished for misrepresenting the dispute to the press after a previous committee hearing when both sides in this bitter dispute were questioned. This in itself was at the very least a moral victory for the unions, which were able to make their case to the government and the wider world (the admonishment is available on the Parliament Live website). Locally, the threat by vice chancellors to deduct 30% and even 100% pay from the point that marks were not submitted was punitive and probably illegal. But that didn't stop them. Some will be reluctant to pay back deductions made when marks are released, causing further unnecessary disruption over the next few weeks. And those who refuse to allow an agreed orderly return to work without undue pressure to hand over marks on unrealistic timescales could also cause further local problems. No one can be in any doubt now that carrying out a boycott of exam and coursework marking can have a serious, possibly permanent effect on students' lives, where securing future employment or training depends on knowing their degree results at the right time. Overseas students with visas running out cannot go home empty handed. The effect this has on the ordinary lecturer who had to continue tutoring and engaging with their students daily over the last few months should not be underestimated. Union leaders have learned how determined and courageous ordinary and, indeed, new members can be. All this will help build the case and determine the form of action that will be needed for a decent increase from 2008. It will not be easy with Gordon Brown's recent promise to freeze public sector pay rises. In that respect the increase secured already may prove to be more of a victory than it currently appears. The pay settlement does seem meagre compared with the claim of 23% over three years to make good some of the shortfall in university pay over the past 20 years. There will be a campaign to vote No to the offer – people are understandably disappointed and angry after such a bitter dispute – but the action has been called off, the negotiators have accepted it, and it will be agreed by ordinary members. One lesson learned is how effective but also how demanding action can be. Those complaining that the offer falls far short of the claim for 23% must reflect on why the claim needed to be so high in the first place: a significant lack of fight on pay for nearly 20 years. That period saw a major government-commissioned report on Higher Education, the Bett report. Bett recommended much enhanced pay and conditions for staff, but unsurprisingly the government never acted on his recommendations. Academics thought that as a report which supported some of the trade union viewpoint had been produced, change would follow. Moral of the tale: there is no substitute for a wage fight, no alternative easier route. So the newly formed UCU has to think hard about how to fight the next phase. Lesson one would seem to be that making up a 20-year deficit in one pay round is unlikely. Lesson two is that waiting another 20 years would be disastrous. As the union regroups, it also needs to consider how are the employers preparing to regroup and how their attack will develop. One development is already evident at Leeds (see box). Vice chancellors forced into a corner by this dispute have already lashed out to say that this level of expenditure on staff pay is "unsustainable". Sustainability is the big word in higher education. All sorts of things are "unsustainable", from individual modules to whole programmes of study, to whole departments (eg, Chemistry at Sussex). Not one engineering department in the land is "sustainable" without foreign students. The latest thing on vice chancellors' lists of the "unsustainable" is staffing. The current model of subject experts teaching and researching a subject is "unsustainable", and while a few such people can be maintained (human equivalent of a rare breeds farm) the curriculum and teaching materials will be designed to be delivered by post graduate students or teaching assistants at a fraction of the pay of qualified staff. This is justified by pointing out that PhD students in some institutions have always contributed to undergraduate teaching. The pretence will be that there is "nothing new" in this and it is "good practice". Neither students nor their parents (who will be paying the fees) will be fooled by the new model. And so the alliance between teachers and students forged in this dispute must be nurtured. The new union, UCU, suspends this dispute for now with some internal bridges to build. The battle for pay in Further Education begins again. It needs to create a firm base and take on the mantle as the guardian of higher and further education for the future. The employers continue to show that they are not up to it. The commodification and globalisation of higher education are becoming ever more apparent. The only way these greedy vice chancellors, with their 25% pay rise over the past three years, can achieve these aims is by bullying their workforce. What is needed is a collaborative, collegiate approach where managers and unions work together in the interests of the students they teach and the society they ultimately serve.